Cut two 1cm pieces, one 2cm and one 6cm piece of chain. 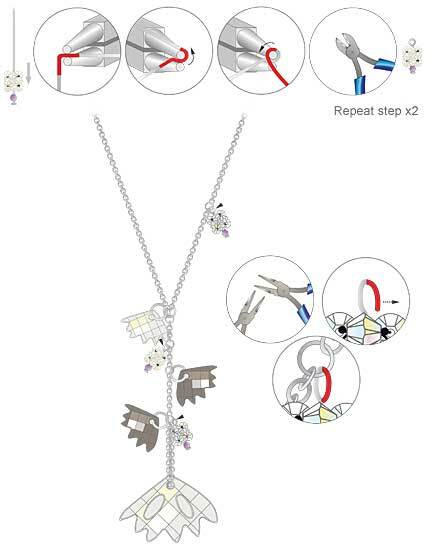 Slide a Swarovski pendant article 6901 30x45mm crystal silver shade onto the 6cm chain piece. 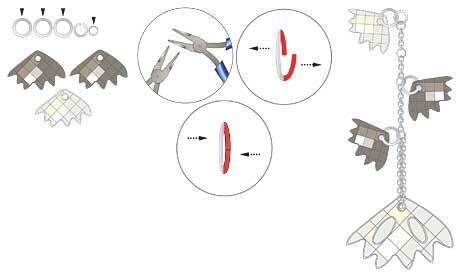 Connect the chains using three 4mm jumprings as shown in the illustrations. Open one 4mm jumpring to attach onto the end of the chain. Attach a 6mm jumpring and close the 4mm jumpring to secure. Open three 8mm jumprings and attach the Swarovski pendants art 6902 16x25mm crystal satin to two of them and one 6902 16x25mm crystal silver shade onto the other. Attach to chain as shown. Cut one 32cm and one 22cm piece of chain and connect the two chain pieces with a 4mm jumpring. Slide it through the 6mm jumpring added in Step 3. Cut 30cm of nylon thread, slide on four Swarovski beads article 5328 4mm crystal AB and weave the thread through the beads. 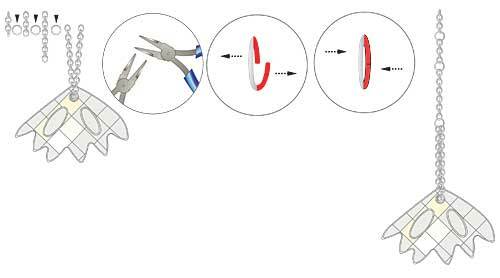 Add one bead to each thread end and thread both thread ends through another bead in opposite directions as shown in the illustration. Add one bead to each end again and then thread both ends in opposite directions through another bead. 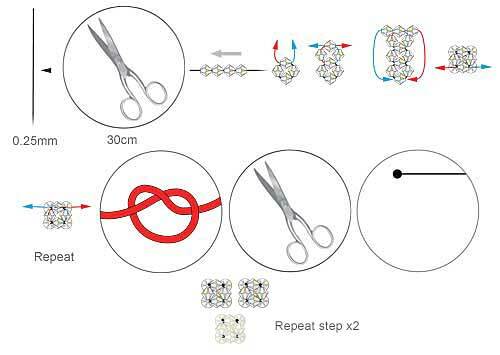 Add one bead to each end again and bring the thread ends down and thread through opposite directions of bottom bead to create a beaded bead as shown in the illustrations. Repeat sliding the thread ends through all of the beads and tie a knot. Melt the nylon thread ends to small balls. Repeat this step two more times once using the Swarovski beads article 5328 4mm crystal AB and once with article 5328 4mm white opal. Slide a Swarovski article 5000 3mm cyclamen opal onto a headpin and add one of the beaded beads created in the previous step. Make a loop at the other end of the headpin close to the beads, (do not close loop completely). Repeat this step with other two beaded beads. Attach the beaded headpins on to the chain as shown in the illustrations. Close all headpin loops to secure. 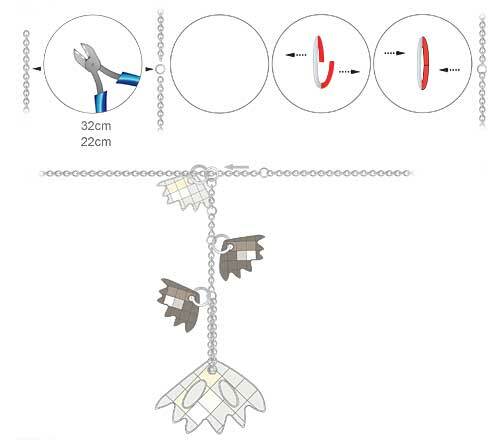 Attach a lobster clasp to one end of the chain using a 4mm jumpring. Attach a 4mm and 6mm jumpring onto the other end of chain.